Let it snow, let it snow, let it snow! 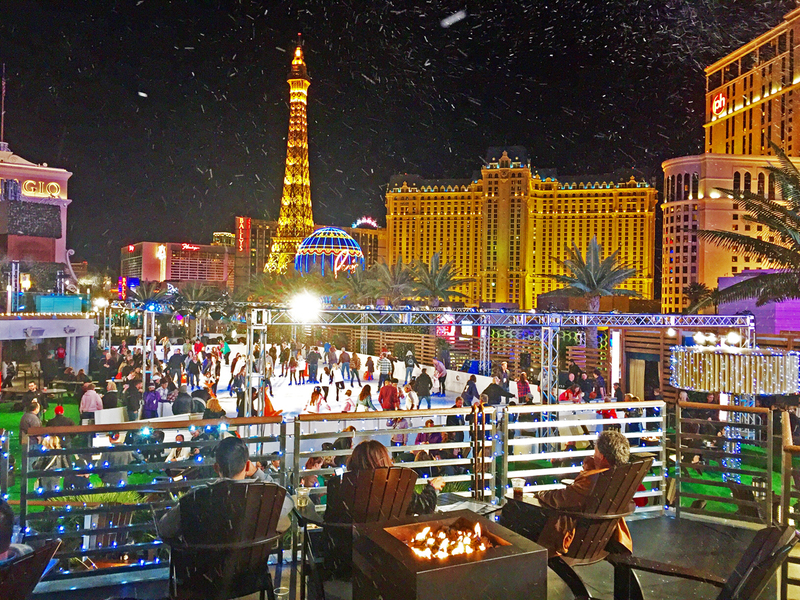 The Cosmopolitan of Las Vegas ice rink is making all our wintry dreams come true with rooftop ice skating, snow flurries, piping hot adult beverages, roasting marshmallows on fire pits and holiday movies, all on the Las Vegas Strip. It’s open now through January 3. The 2014 Bellagio Conservatory. Photo courtesy of the Las Vegas Sun. The Waterfall Atrium. Photo courtesy of Palazzo. 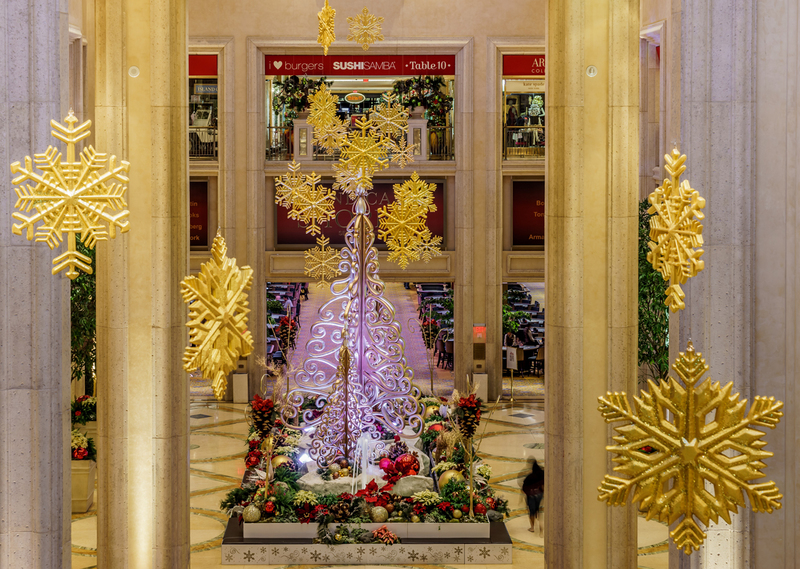 The Waterfall Atrium showcases a holiday display with hand designed snowflakes drifting down from the ceiling, as well as 1,000 ornaments, 2,500 poinsettias, silver bush, lambs ear, ferns and glitter birch trees. The filigree trees are the centerpiece, the culinary inspiration from the pastry chefs, weighing a combined 2,700 pounds. Gold Manzanita reindeer were constructed by hand and there are 80 crystal ribbons twisted through the two 16-foot-tall Manzanita trees. The gingerbread village at Four Seasons. Photo courtesy of Miranda Boyd/Vegas.com. 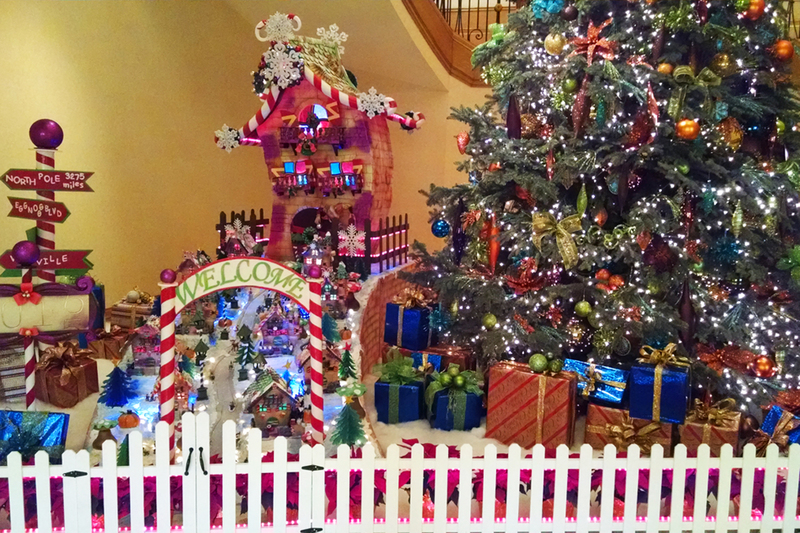 The Four Seasons’ pastry team, led by Chef Jean-Luc Daul, spent 250 hours assembling the holiday gingerbread village. If you think your holiday feast is crazy, get a load of this grocery list: 180 pounds of powdered sugar, five pounds of flour, two pounds of cornstarch, 90 pounds of dark chocolate, 40 pounds of milk chocolate, 10 pounds of white chocolate, 60 pounds of almond marzipan, 20 pounds of egg whites, 45 pounds of fondant, one pound of gingerbread spice and one pound of ground cinnamon. Whew, your gingerbread house is a cake walk compared to this. Magical Forest at Opportunity Village. Photo courtesy of Opportunity Village. In Vegas, even Santa arrives in style. This year, the big guy made his grand entrance to the Magical Forest in a Papillon helicopter. In its 24th year, it’s like a Christmasy carnival on steroids. 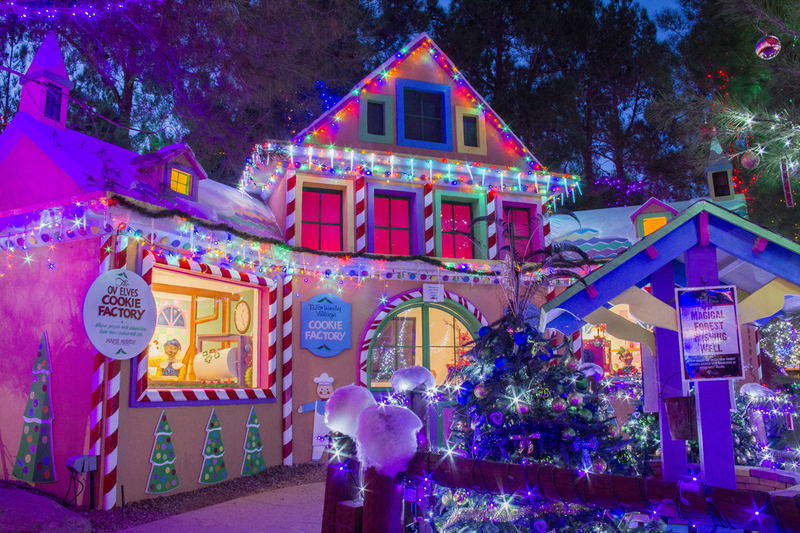 There are hundreds of decorated trees, more than 3 million lights, gingerbread houses, nightly entertainment and rides for all your little elves. The lobby of the Cosmopolitan. Photo courtesy of Erik Kabik. 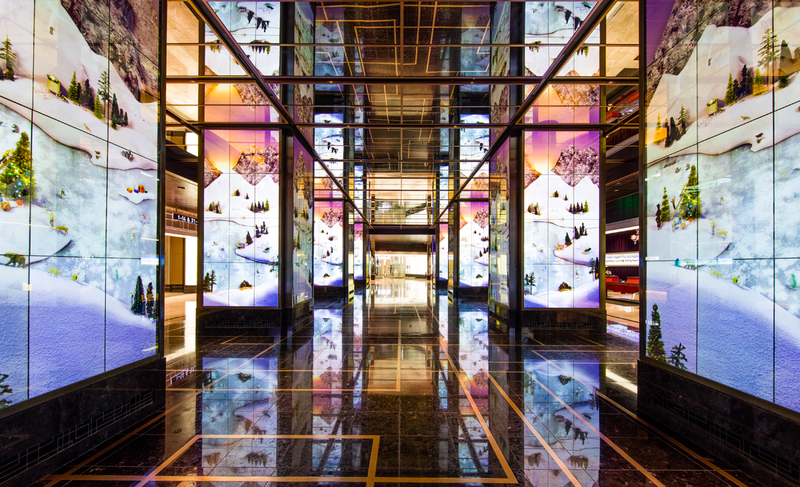 The latest digital art installation in the lobby of the Cosmopolitan of Las Vegas is called “Little Winter.” It’s a one-of-a-kind physical/digital hybrid of five different vignettes that were first handmade diorama models. The pieces were digitally animated and filmed to create the videos seen on the digital pillars that are each wrapped in LCD displays. Holiday Catcus Garden at Ethel M. Photo courtesy of Ashley Oñoz-Wright/Vegas.com. The rest of the country may have their bristly Douglas firs, but in Vegas we just gotta work with what we’ve got. And that happens to be cactus. 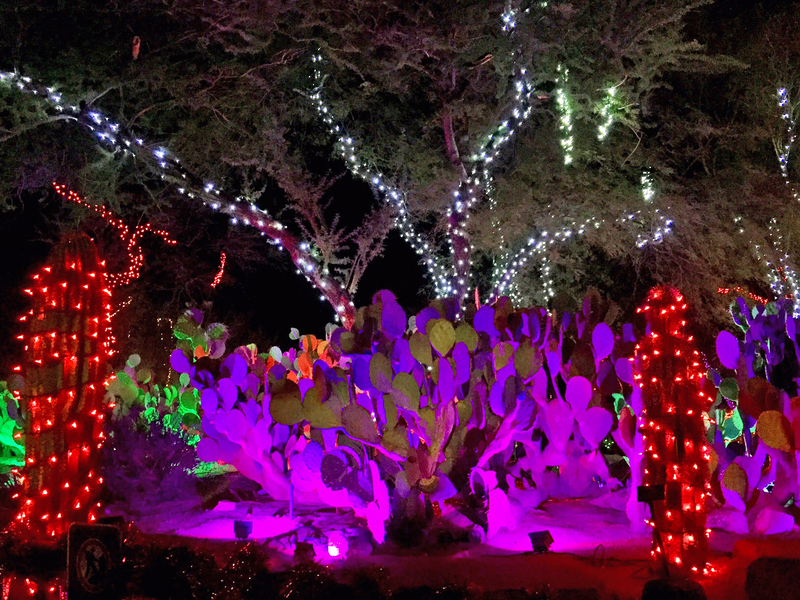 Every inch of the three-acre cactus garden at Ethel M Chocolate Factory is covered in glittery goodness. 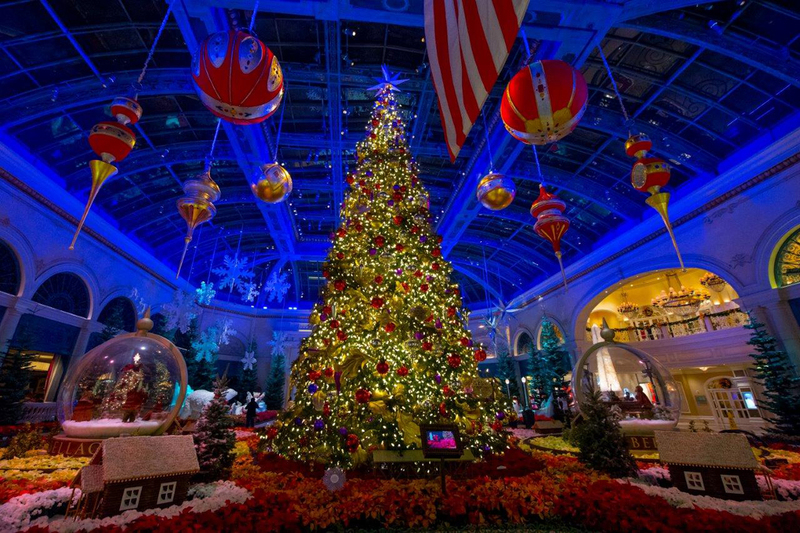 More than half a million lights, animated reindeer and holiday décor cover the desert grounds through New Year’s Day. Holiday light tunnel at the Las Vegas Motor Speedway. Photo courtesy of Glittering Lights. 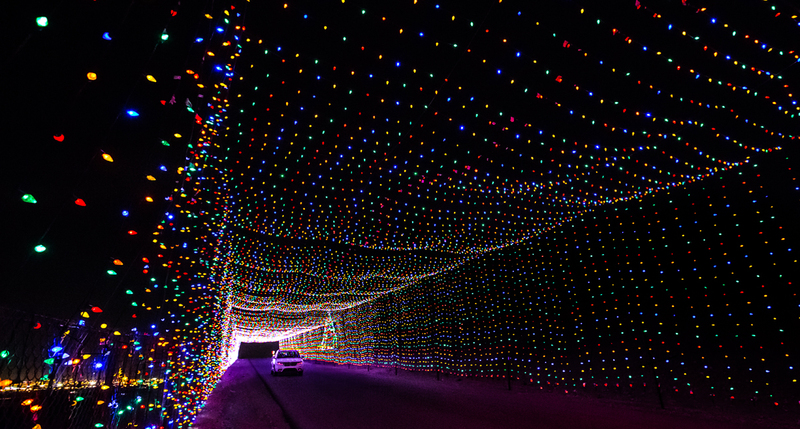 Have you ever wondered what the state’s largest drive-thru light show looks like? One word: massive. More than 150,000 visitors come to see the three million lights and 500 animated displays at the Las Vegas Motor Speedway. Every Thursday through Saturday, they’ve also got a live nativity. In its fifteenth year, the 2.5-mile course hosts 30,000 vehicles during the holiday season and is open until January 3. Santa on the Grand Staircase. Photo courtesy of Kirvin Doak. Word on the street is that not even an iceberg can stop Santa’s sleigh. 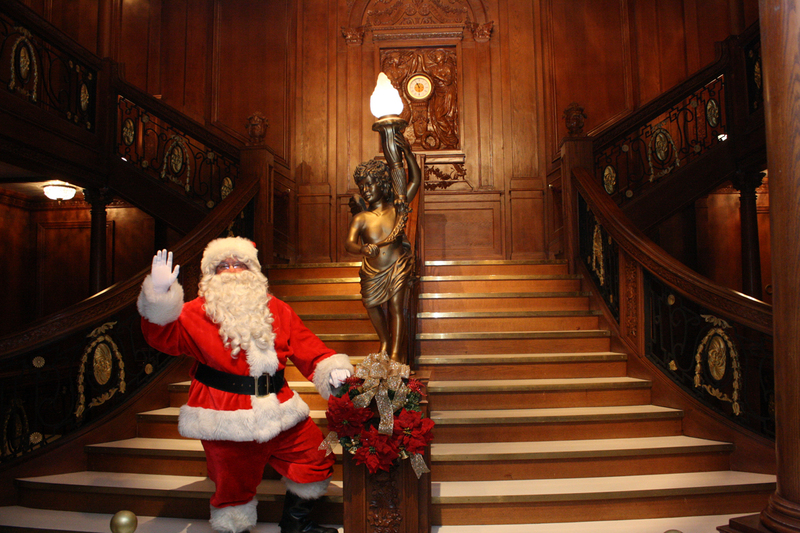 He’s at Titanic: The Artifact Exhibition every Saturday through Christmas from 1 p.m. to 3 p.m. Looking for that lump of coal? Get ready to be impressed, because the only authentic artifact for sale is a commemorative piece of coal that was part of the nearly 6,000 tons aboard the R.M.S. Titanic. They’ve also got perfume inspired by a first class passenger who hoped to sell his custom fragrances when he reached New York. Santa Claus and Santa Jaws at the Shark Reef. Photo courtesy of MGM Resorts International. Only in Vegas can you take photos with Scuba Santa and Santa Jaws. 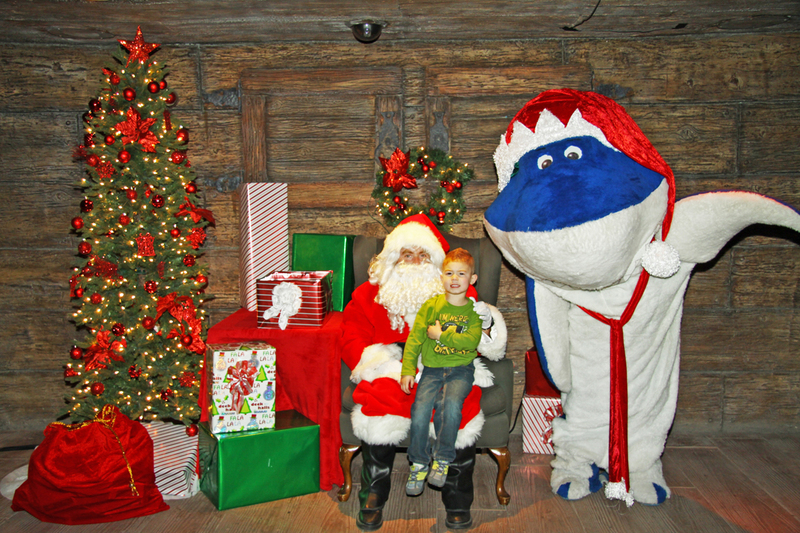 The Shark Reef in Mandalay Bay is hosting photos with Santa in the Shipwreck every Saturday and Sunday from 10 a.m. to 4 p.m. and from every day from December 19 through Christmas Eve from 10 a.m. to 4 p.m. Then stick around for Scuba Santa swimming with the sharks at 4 p.m. Photos are free with the price of admission. The Linq tree-lighting ceremony. Photo courtesy of Denise Truscello. As if you’d ever be cool enough to have Britney Spears light up your Christmas tree. She switched on the lights of the 30-foot tall tree at The Linq this year and kicked off their 25 Days of Celebration. Each day offers a different way to enjoy the season, from free treats on the promenade to deals in the shops and on the High Roller. Holiday lights at Mystic Falls Park. Photo courtesy of Sam’s Town. A winter wonderland with more than 50 twinkling trees, snow-covered lamp posts and more, the Mystic Falls Park holiday tradition inside Sam’s Town is on its 18th year. 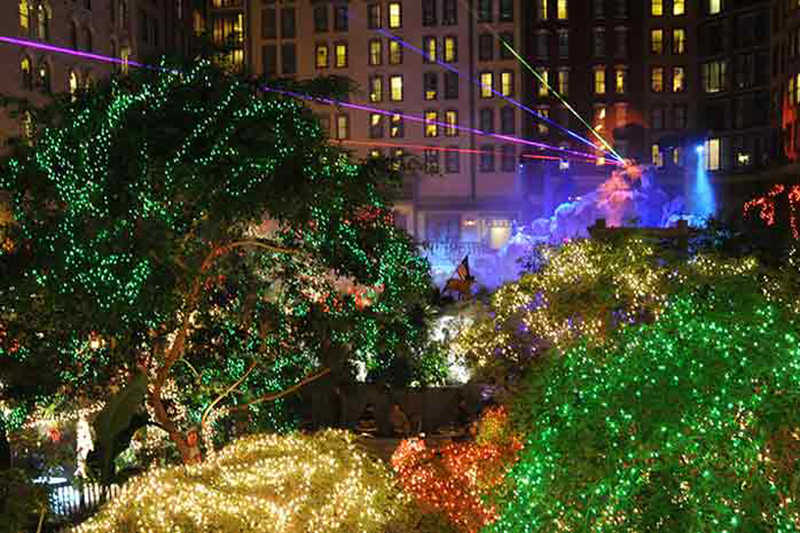 Guests can watch the snow float and dance above during the laser light and bubbling fountain show. 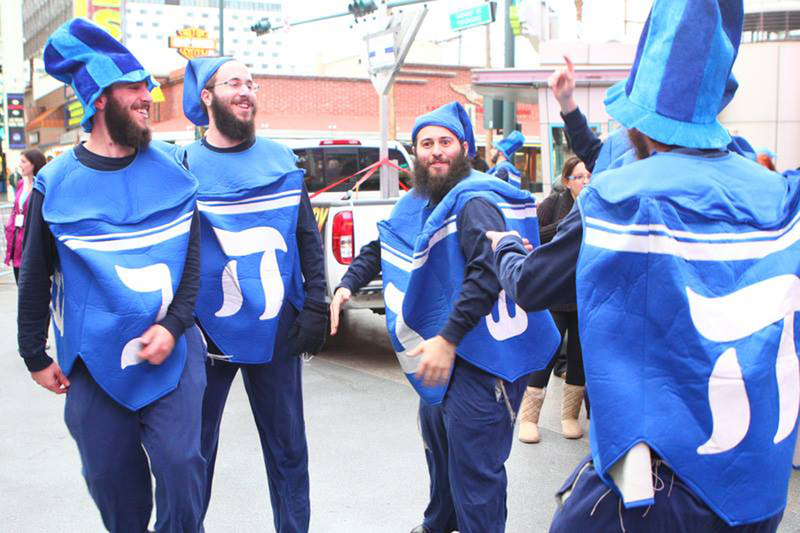 The 2014 Grand Menorah Lighting on Fremont Street. Photo courtesy of Fremont Street Experience. The Fremont Street Experience is always full of lights, but during the holidays, they really go the extra mile. Members of the Chabad of Southern Nevada are helping kick off the Festival of Lights this year with the Grand Menorah Lighting that will stay up throughout the holiday season. There’s also a Christmas Tree Lighting Ceremony, the Viva Vision screens that play holiday music and Country Christmas concerts on the 1st Street stage all holiday season long. Santa’s headquarters during Snow in the Square. Photo courtesy of Town Square. Snow in the Square happens every week day at 7 p.m. and every weekend at 7 and 8 p.m. in Town Square. We’ll take every chance we can get to see snow in the desert, even if it’s for 10 glorious minutes. The show is choreographed to holiday music so you can shop and sway before getting pictures with jolly old Saint Nick. Santa and his little helpers on the catwalk. Photo courtesy of Fashion Show Mall. 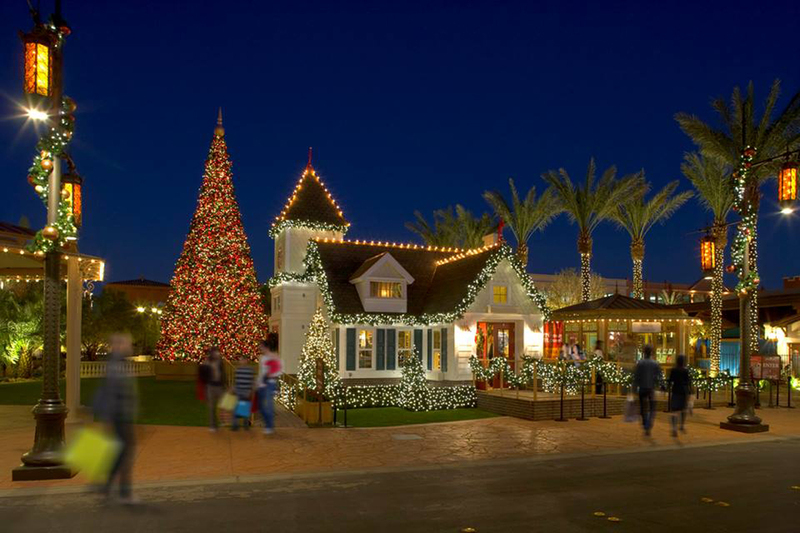 Take the kids on a special holiday mission with Adventure to Santa at the Fashion Show Mall. You’ll have a chance to explore Santa’s house (which has obviously been relocated from the North Pole temporarily), hop on a sleigh ride and have your photos taken. There’s also a special holiday gift you’ll bring home that they swear you’ll never forget. For the kid’s sake, hopefully it’s not a tattoo.